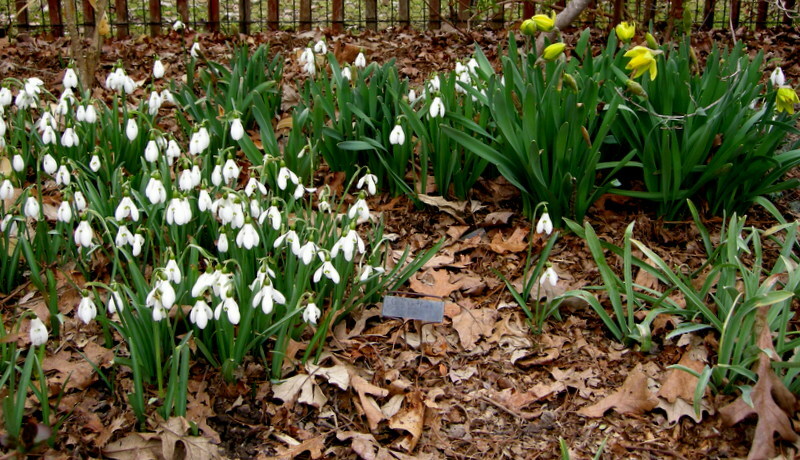 This entry was posted on January 5, 2015 at 5:32 pm and is filed under bulbs for shade, Shade Perennials, snowdrops, winter, winter interest with tags Carolyn's Shade Gardens, collecting snowdrops, galanthophile, galanthus, snowdrop, snowdrop articles, snowdrop bulbs, snowdrop catalogue, snowdrop companion plants, snowdrop flower, snowdrop plants, snowdrops, snowdrops for sale, snowdrops for sale U.S., snowdrops in the green. You can follow any responses to this entry through the RSS 2.0 feed. You can leave a response, or trackback from your own site. 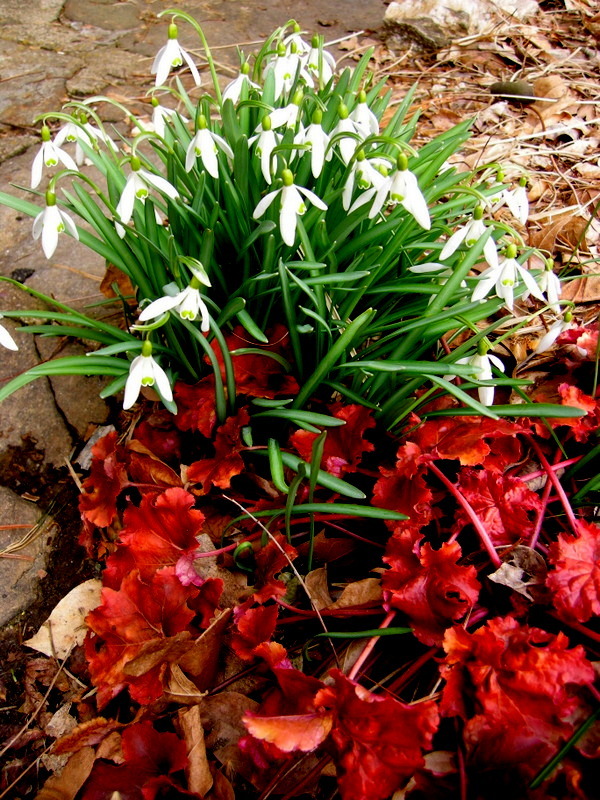 You’ve convinced me to add more Snowdrops! I really like the combinations–especially with Winter Aconite, Lamium, and Coral Bells. Thanks! That last photo is breathtaking! 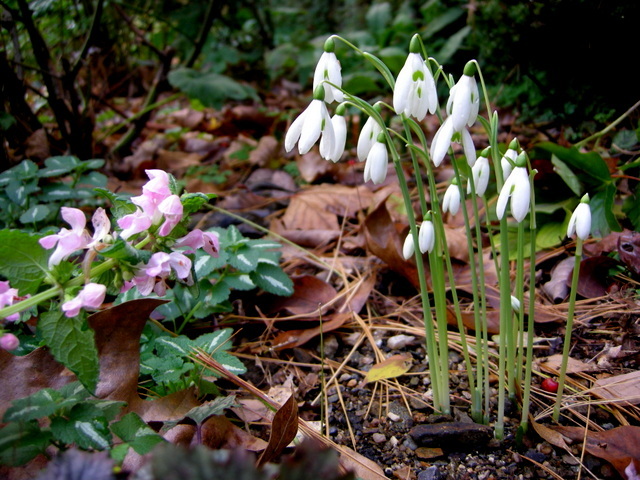 You have shown some wonderful companions for snowdrops. I like the arums! I wish you much happiness and success in 2015! Now I know what’s missing in my garden. Snowdrops! Thank you for the inspiration. 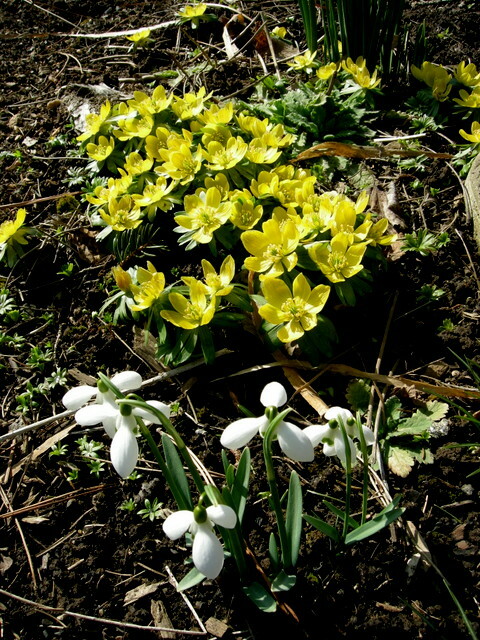 I really like the combination of the snowdrops and winter aconite. That would look pretty like in the image of the French forest. 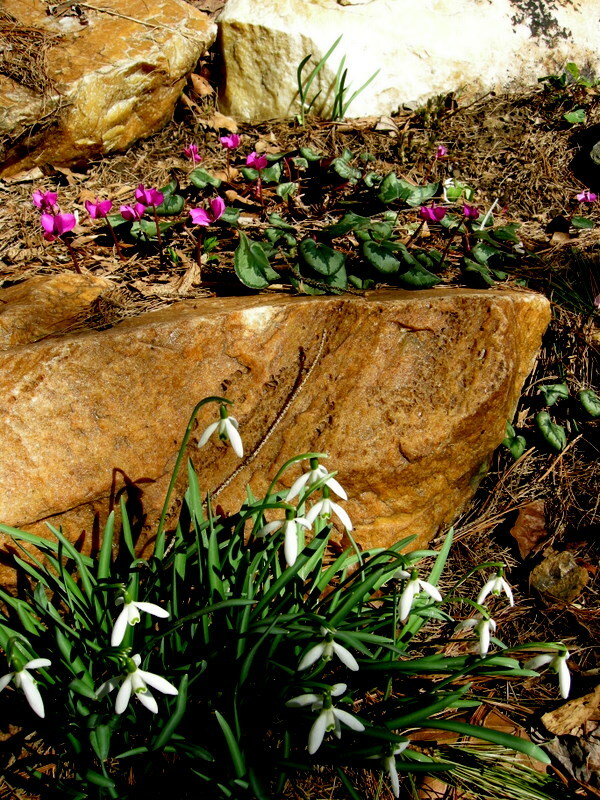 Great photos of your spring garden! In my zone 5 (very occasionally zone 6), my late winter plants such as arum italicum, hellebores and evergreen ferns look a little sad. Other than creating a more sheltered garden, would fertilizing help? All I do is mulch each fall with shredded oak leaves. 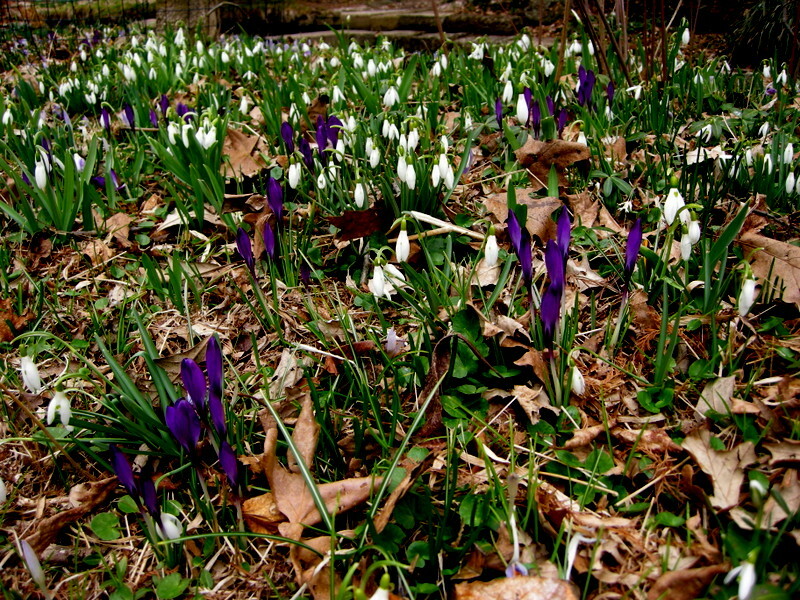 My snowdrops, winter aconite and crocus come up fine. Your garden is lovely. Your color combinations are so well thought out, and your planning and hard work show. I sure wish I could see it. Megan and her family are in CT now, so we are driving that way whenever we can. Since my husband is still working full time, we aren’t traveling as much as we’d like. Good luck with your snowdrop sales. So glad you are spreading the word. I read the snowdrop book with your interesting interview!! I love your companions and should take note…now if I could just get it together enough to order some snowdrops before they are all gone. Good to see your post Carolyn, I have gained a woodland area so interested to see these options. I wont go mad as I am tightening the budget at the moment. Ah, snowdrop time again, I love it! 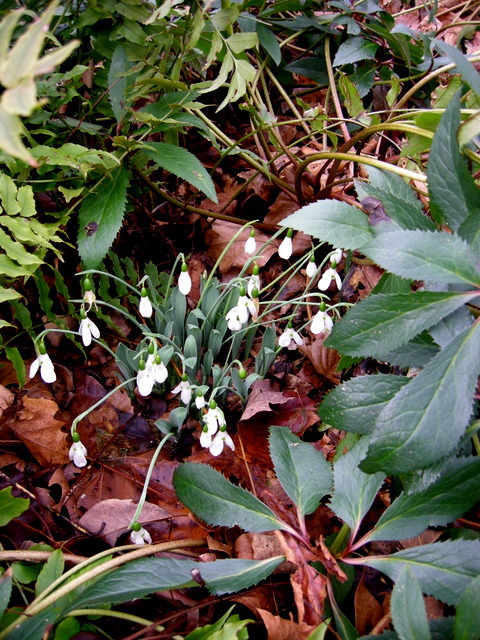 The first snowdrop is already finished flowering in my garden but I have many more in flower and many more to come – and many have not emerged yet on my shady side. I got two new ones for Christmas, Galanthus elwesii ‘H. 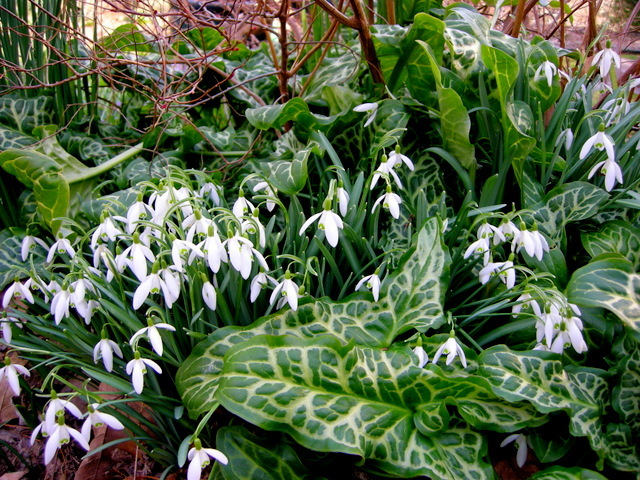 Purcell’ and Galanthus elwesii ‘Maidwell L’. The Henry Purcell was just one single snowdrop in a pot so I hope he survives and gets many babies! 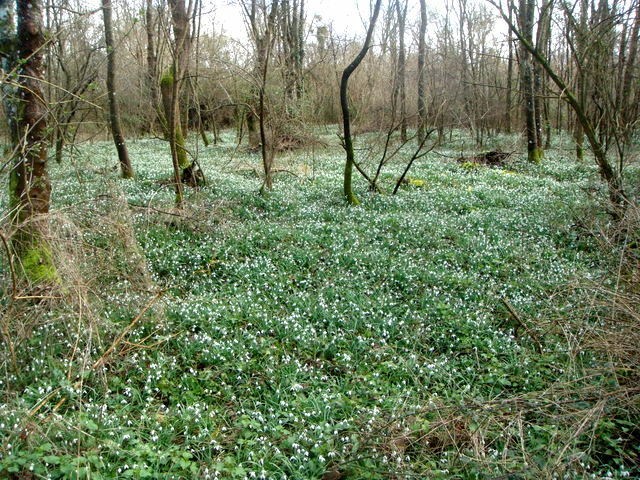 I look jealously upon your snowdrop collection. Atlanta is unkind to them. I’ve had failure after failure with the species and cultivars. 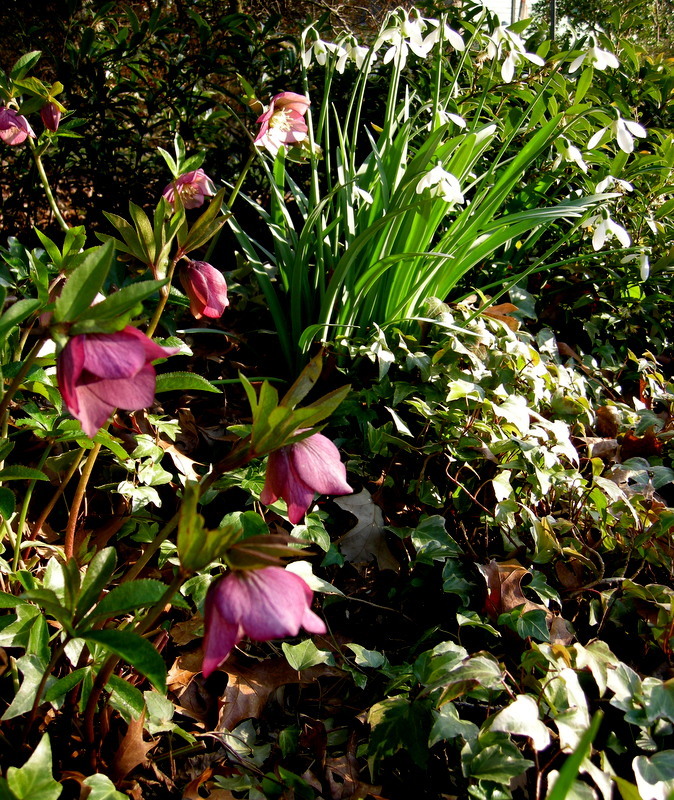 How I would love snowdrops by my Onyx Odyssey hellebores. Oh well, lots of edgeworthias in full bloom now give me solace and the crocus are starting to open too. 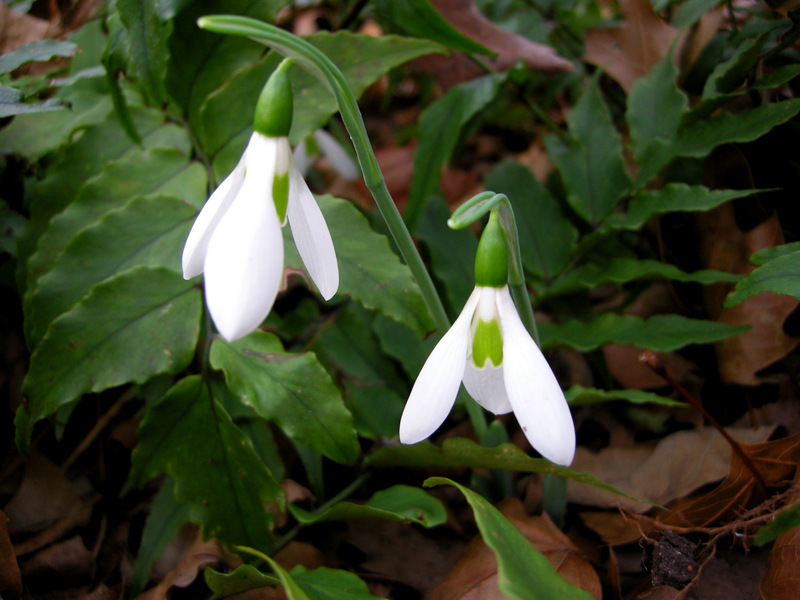 That said, I’d love to hear of any snowdrop cultivars that have been demonstrated to do well in the south. You have a wonderful website and blog. I hope to visit your garden someday. 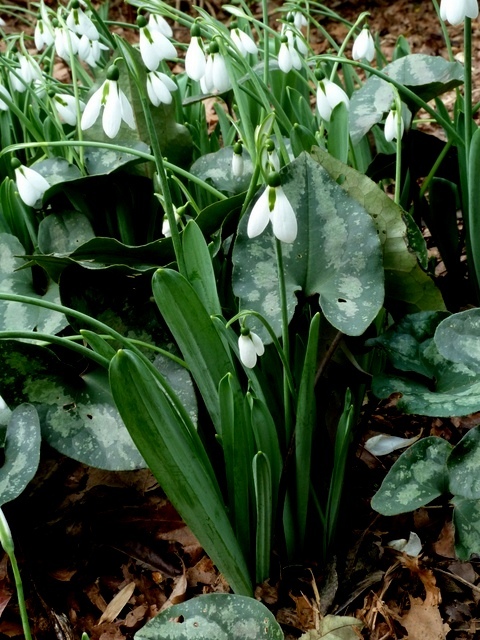 Can you give me advice on weeds amongst snowdrops? 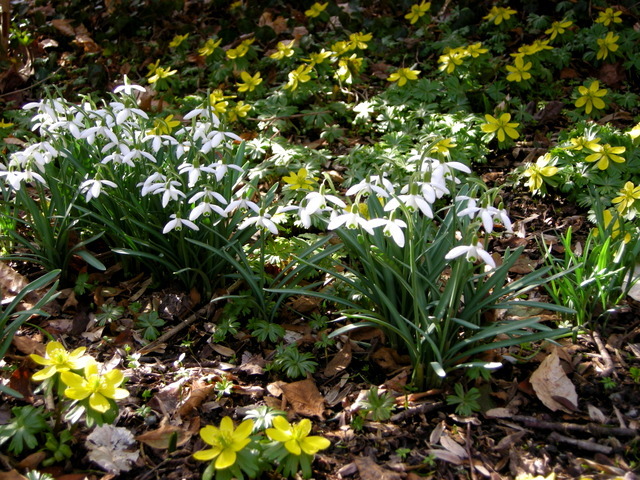 Our home’s previous owners created 2 areas with naturalized snowdrops. 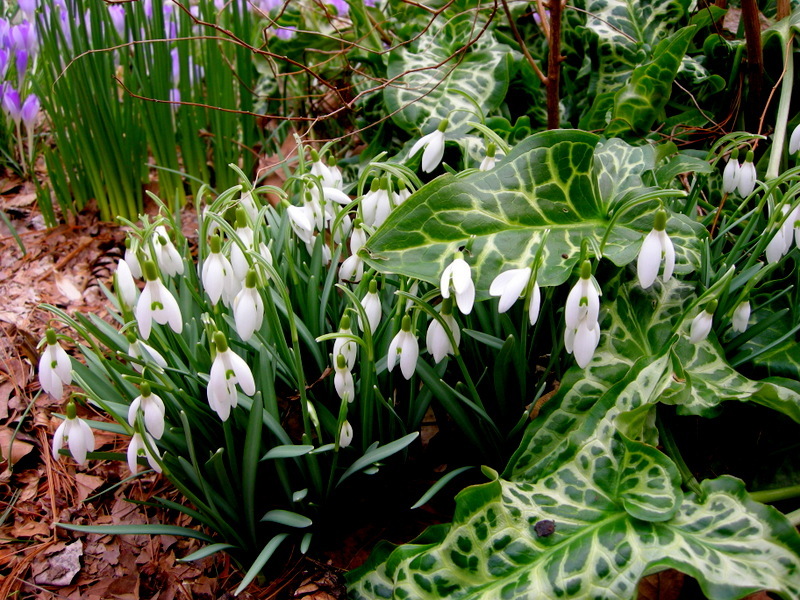 One side of a walkway has snowdrops that come up out of periwinkle/vinca. 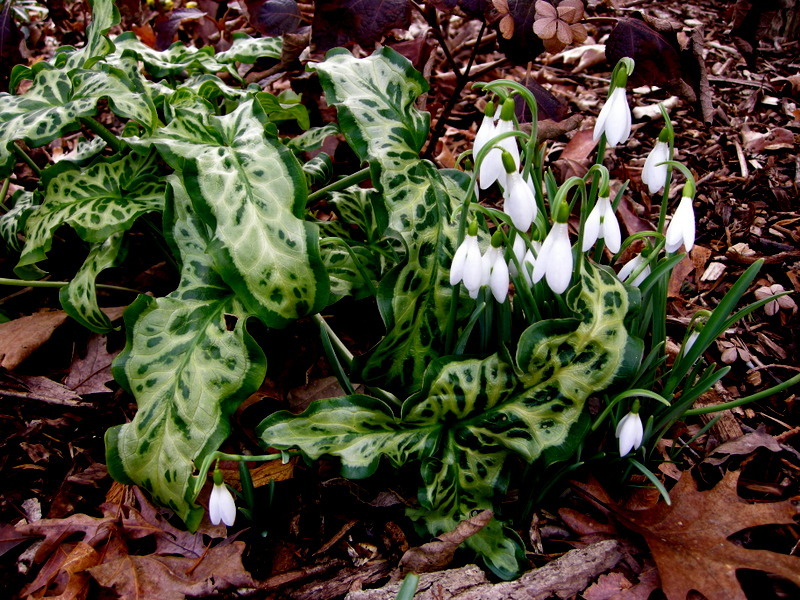 The other side has snowdrops mixed in with various weeds and groundcover (pachysandra, ivy). 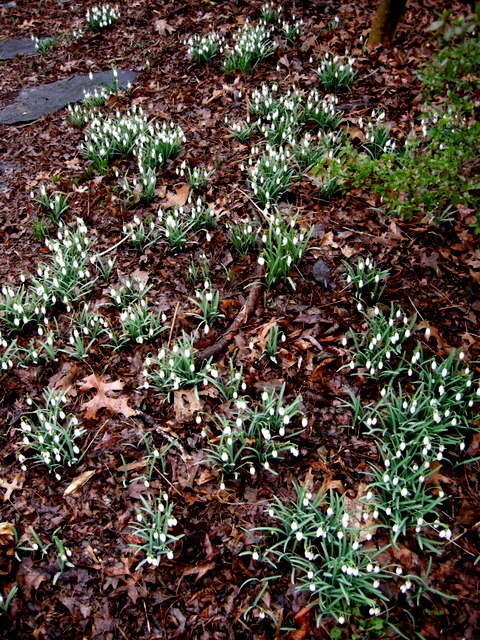 I plan to leave the vinca alone, but will vinca choke out the snowdrops? Is there anything i should keep in mind as i clear the weeds and mixed groundcover on the other side? Since we recently cut the tree that was shading this area, there is probably too much afternoon sun. Can i sow annual flower seeds on the surface in order to shade the area and keep weeds down? We do plan to plant a new tree. When there is more shade i plan to plant some companion plants that you suggested in the blog.